The Sumela Monastery (Turkish: Sümela Manastırı, Moní Panagías Soumelá), is a Greek Orthodox monastery dedicated to the Virgin Mary (Panagia, meaning "All Holy" in Greek) at Melá mountain, in the region of Maçka in the Trabzon Province of modernTurkey. 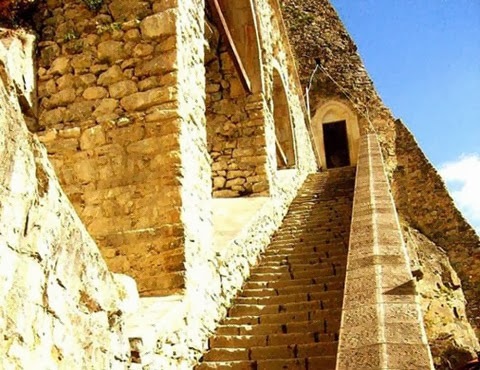 Nestled in a steep cliff at an altitude of about 1,200 metres (3,900 ft) facing the Altındere valley, it is a site of great historical and cultural significance, as well as a major tourist attraction of Altındere National Park. 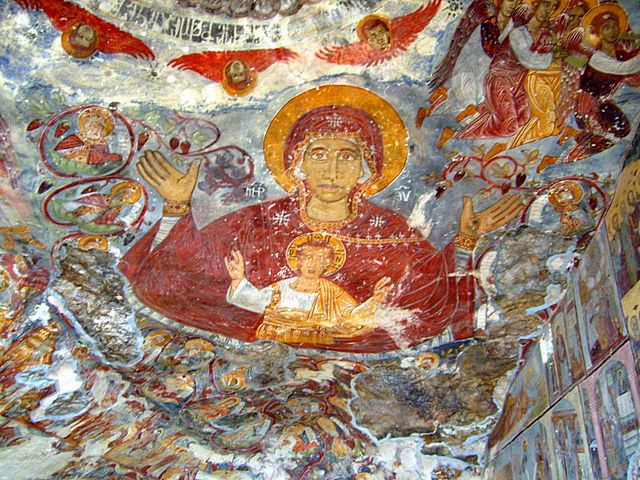 The monastery was founded in 386 AD during the reign of the Emperor Theodosius I (375 - 395),Legend has it that two priests undertook its creation after discovering a miraculous icon of the Virgin Mary in a cave on the mountain. It reached its present form in the 13th century after gaining prominence during the reign of Alexios III (1349 - 1390) of the Komnenian Empire of Trebizond, established in 1204. At that time, the monastery was granted an amount annually from imperial funds. During the time of Manuel III, son of Alexius III, and during the reigns of subsequent princes, Sumela gained further wealth from imperial grants. Following the conquest by theOttoman Sultan Mehmed II in 1461, it was granted the sultan's protection and given rights and privileges that were renewed by following sultans. 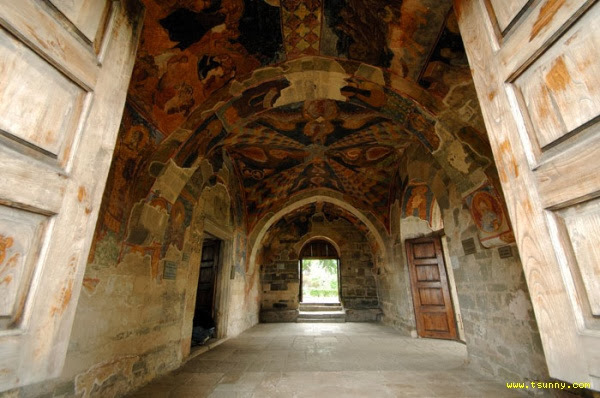 The monastery remained a popular destination for monks and travelers through the years. The site was abandoned in 1923, following forced population exchanges between Greece and Turkey. The departing monks were not allowed to take any property with them, so they buried Sumela's famous icon under the floor of the monastery's St. Barbara chapel. In 1930, a monk secretly returned to Sumela and retrieved the icon, transferring it to the new Panagia Soumela Monastery, on the slopes of Mount Vermion, near the town of Naousa, in Macedonia, Greece. 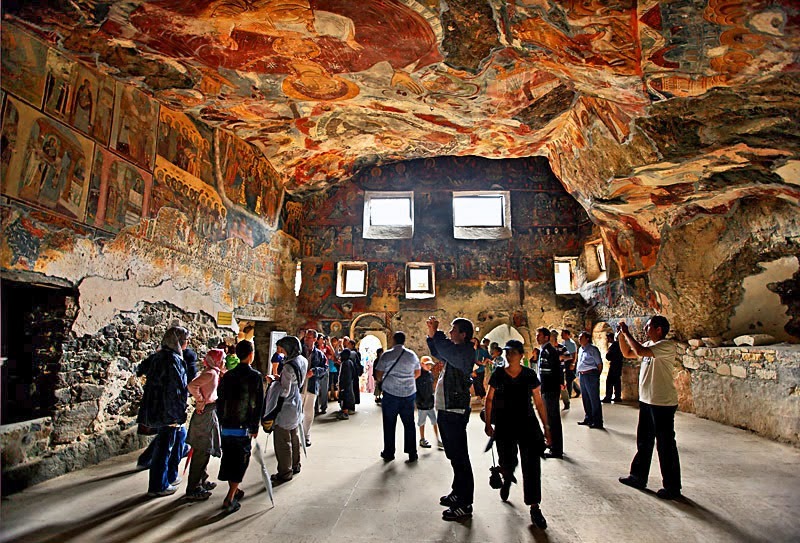 Today the monastery's primary function is as a tourist attraction. It overlooks forests and streams, making it extremely popular for its aesthetic attraction as well as for its cultural and religious significance.